An association has special needs relating to obtaining merchant accounts and credit card processing solutions for its membership. We’ll briefly set out some of the special benefits associations can enjoy by offering to assist their members with their credit card processing needs. Then we will present our recommendations of four leading merchant account providers who offer unique programs for associations. Most associations keep a constant lookout for means to add value to the benefits programs they offer their members. One often overlooked – but very significant – method of so doing is to incorporate merchant accounts into your benefits package. Reduced discount rates, transactions fees and hardware/software costs for your members. Customized processing programs can be created for your membership. Residual income to your association itself – earn a portion of every sale processed by each of your members. Earn a royalty on your members’ purchases of credit card processing equipment and software, internet payment gateways, etc. Additional marketing and promotion opportunities to your membership. 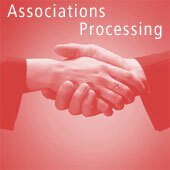 Through its Trade Association Partnership Program, EZMS can provide reduced fees your members’ processing (e.g. transaction and discount rate fees, as well as monthly statement costs). Wholesale prices for your members’ point-of-sale processing terminals and software is also available. Forward the fee reductions to your members – or use the savings as an extra source of revenue for your association itself. Receive residual commissions on your members’ merchant accounts, year after year. Advanced Merchant Systems has worked with hundreds of associations to provide members with group discounts on credit card processing. AMS can negotiate extremely low rates for association members, while bringing a sense of pride and member advocacy to the entire association You can gain access to the lowest rates in the industry, profit share on every transaction, enjoy customized solutions to meet your members’ needs – and receive unparalleled customer support. They can also handle your conference & convention processing needs. AmeriTranz offers unique ‘card processing’ partnerships to any association wishing to maximize cashflow by developing an additional income stream. Each program can be specifically tailored to your association or organization and can help you add new members to your base. CardService International can assist organizations seeking value-added programs for their members or franchisees. It offers its participation in your association or franchise’s special events. CSI specializes in internet merchant accounts.